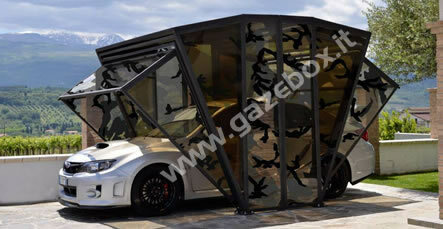 Looking for that extra space to park at car at home? If this space doesn’t exist, CARDOK may be the right solution for you! 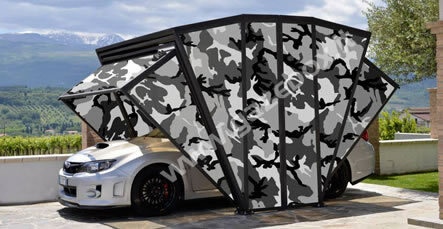 CARDOK is an innovate approach to car storage whether storing 1 to 6 cars as well as the option for an automative CarTurn, lifts and more. CARDOK out of Switzerland can be used for all sorts of needs such as boat storage or even a wine cellar. The security and technological advancements made by CARDOK make them a leader in luxury vehicle storage. 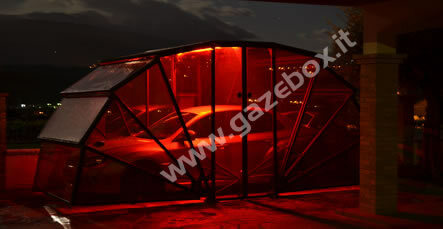 Need that extra garage space at home? 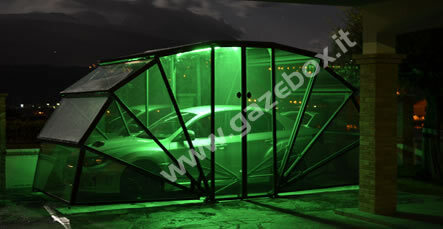 Stop using the tree as a protection and add some glamour to your driveway! 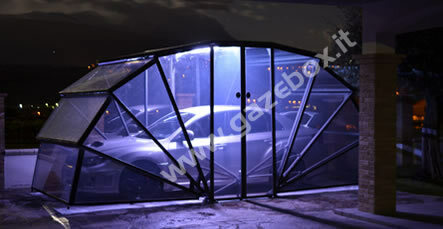 The new concept of garage. 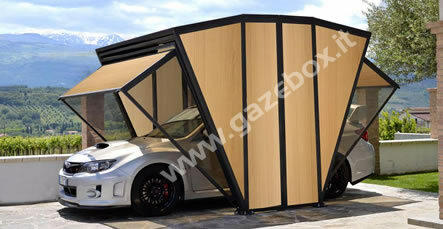 Carport, Garage and Gazebo…ALL IN ONE! 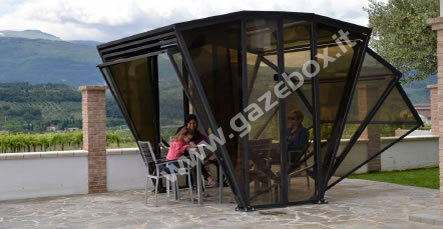 GazeBox is the new and revolutionary foldable cover system. 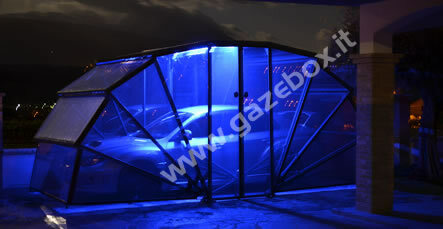 It can be used as a modern gazebo or as a garage for cars. 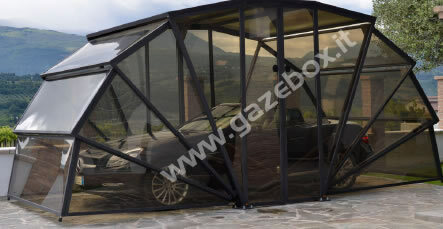 The special anti UV polycarbonate panels give protection from the sun, hail, rain, wind, ice, pets and birds. . Does not retain the heat. Easy to install, no special permissions required. “Made in Italy” patented product. • Panels with a range of patterned surfaces. Set the thermostat at 70° to 75°F when you’re home, 80°F when you’re not; don’t turn it off completely before leaving the house (it can cost more to cool the house back down once it overheats). Position electric devices like lamps, TVs, or computers at least a few feet away from your AC thermostat. Reason: The AC can sense heat from these appliances, which can cause it to run longer than necessary. Place room units on the north side of the house when possible. An AC unit operating in the shade uses up to 10% less electricity than one in the sun. Long-term fix: Plant trees to shade your windows and save as much as 25% of the energy a typical home uses. Know when to upgrade. In terms of energy use, you may want to consider a new AC if yours is more than 10 years old (window unit) or 12 years old (central air) — and definitely if it’s not cooling as well as it used to — to shave up to 30% off your bill. Move indoor plants outside — they produce a lot of airborne moisture. Invest in a dehumidifier. The 70-pint Frigidaire ($193; amazon.com) zapped humidity best in GHRI tests. Run bathroom exhaust fans for a full 20 minutes after a shower or bath to “dry” the air. Attics can reach temps of 150°F. Take measures to properly insulate this area from the rest of the house: Install sweeps and weather-stripping around the door (about $10 and $8 for a roll, respectively, at hardware stores). For a hatch-style entrance, invest in a stair-insulator cover like the Attic Tent ($200 to $240; attictent.com) to seal it. Line-dry clothes outdoors — there’s nothing like that fresh smell! — and skip the dryer (the costliest part of doing laundry). Hang towels that are soggy from a day at the beach or pool to dry in the sun over a line, a railing, or the back of a chair. Bonus, if towels will be used again before laundering: Solar rays can kill some smell-causing bacteria. Use a portable fan in conjunction with your AC to move air without greatly increasing your power use (it’ll even save money, because you can comfortably set the thermostat a few degrees higher). No AC? Fake it by putting a dish of ice water in front of the fan. Be smart about ceiling fans Since they don’t actually cool — you need to be in their path to get the benefits — turn off all fans when you’re heading out to avoid wasting energy. If you’re buying a new ceiling fan, make sure it’s sized right for your room (the fan’s box should list its specs). As temperatures climb, so does air conditioner usage. And that means higher utility bills. You can save big bucks if you just perform a few simple maintenance tasks that will enable your air conditioner to operate more efficiently. To learn these easy, money-saving techniques, first choose the type of air conditioner below. We can thank the industrial revolution for the advent of air conditioning. It was believed that controlling heat and humidity in the workplace increased worker productivity. Soon though, air conditioning for personal comfort became accepted as well. One of the first examples of this is the central cooling and heating system designed for the New York Stock Exchange building in 1902. Home air conditioning became popular after World War II and has become a standard feature in many homes across America. Beside changing an air filter once a month, central air doesn’t require much in the way of maintenance, but by following the steps below you may be able to avoid future repair bills. A dirty coil will hinder the unit’s ability to cool the air moving through the unit. This makes the unit work harder wasting energy and money. 1. Remove the front panel of the indoor unit exposing the system’s coil.2. Ensure that the coil is dry. Using the soft brush attachment on your vacuum cleaner, gently remove any dust or debris from the coil. 1. Turn the unit off and remove the air filter.2. You should be able to access the fan blades and the fan enclosure area. Use a cleaning brush and your vacuum cleaner’s attachments to remove as much of the dust and any other debris as you can. 1. It is best to perform this task with the help of another person.2. Turn off the unit. Summer is about relaxing and enjoying the season. From cooling interior color palettes to opting for casual interiors over the stuffy formal ones, summer decor ideas are easy. Do you have a summer beach house, or would you like your apartment to FEEL like a summer beach house? Either way, the warm outdoors and cool evening breezes make your home the optimal place to entertain and relax. Try these easy summer decor ideas to take advantage of all that the season has to offer. FURNITURE: Dark and muted tones are perfect for fall and winter, but spring and summer scream for light and airy colors. Use removable slipcovers, or decorative throws to bring bursts of color and brightness. Prefer whites and neutrals? White and khaki slipcovers are casual but can be dressed up with formal throw pillows in an instant. DRAPERY: When you want to bring in the cool night air, and keep out the hot summer sun use curtains instead of drapery. Drapery material is heavy and dark, while curtains paired with sheers can give you versatile flexibility in the summer months. If you prefer to savor the views, and not cover up the windows use valances. Valances in summer textures and colors will leave your windows looking finished, with an obstructed view. BRING IN THE OUTDOORS: When you think of summer it’s all about the feelings of the outdoors. Flowers, plants and fresh fruit centerpieces make your home smell aromatic and look beautiful. For a more rustic feel, try bringing in eco-friendly materials like bamboo, hemp, and jute area rugs. These materials bring an exotic and natural feeling of the outdoors in. Remember, entertaining outdoors will also give a welcome break to being inside. Summer is about being flexible and spontaneous! VIEWS: What better way to welcome summer into your home, than looking at a breathtaking view? Maximize your furniture placement by facing it towards your ocean view, pool, or lush green yard. Your enjoyment of your home is based on your emotions. If opening windows to hear nature makes you feel good, do it! Don’t love the view from your windows? Consider buying a painting or wall decor that you love the look and feel of. KID FRIENDLY: Let’s face it, kids are out of school and summer time means kids around the house! Make sure fabrics and slipcovers are machine washable, and are casual and fun! Make summer time arts and crafts projects with seashells, pine cones, and nature inspired finds, which the kids can pick out. Their projects can turn into summer décor that you display proudly around your home! Summer decor is all about finding the right balance between enjoyment, relaxing, and livable interiors. Try these tips for your home and see if you don’t instantly feel like taking the day off to enjoy your summer home.